My Fair Lady Returns – July 5th! Yes! By popular demand, My Fair Lady is back for just TWO more performances on July 5th (4:00 pm and 8:00 pm), at the Hirsch Theatre. If you missed buying tickets for the previous 7 shows, don’t forget to purchase tickets early this time. What do we do when we’ve just had our biggest success? 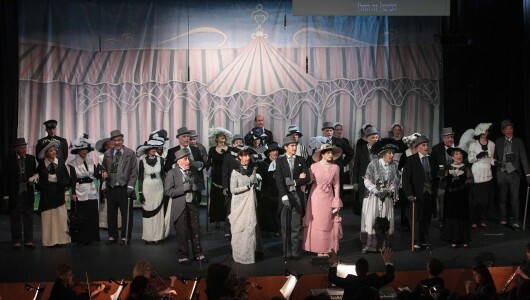 Seven completely sold out performances with audiences telling us that My Fair Lady was absolutely the best production we’ve ever put on (yes, even better than Fiddler, Oklahoma, or any of our wonderful G&S repertoire); that the performers were first-rate, the staging imaginative, the costumes and sets dazzling. We have been able to book the Hirsch Theatre for one more day, July 5, when we will do two more performances to satisfy any of you who missed out before. Need we add that seating is limited and that this will absolutely be your last chance to see this production, musical theater at its absolute best? Get your tickets online or at the Beit Shmuel box office (02-620-3463).